WCGFI - Granite Countertops, Granite Counter Tops, Laminate Floors, Travertine Tile, Cabinets and Natural Stone Fireplace product distribution sales in Portland, Oregon, USA! Quality kitchen and floor products. Welcome to West Coast Granite and Flooring, Inc.! 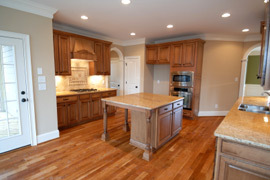 Welcome to West Coast Granite and Flooring, Inc. website! We are a distribution company located in Portland, Oregon USA. We offer quality home products such as: granite countertops, prefabricated granite counter tops, laminate floor, hardwood floor, engineered floor, solid floor, travertine tile, marble tile, tumbled stone tile, tile pattern sets, mouldings, mosaics, medallions, sinks, cabinets as well as natural stone fireplaces. Our products are quality products and we offer some of the lowest prices around. These are products that make your home really feel like home, look rich and beautiful. We have a great variety of quality granite countertops in stock for you to choose from that can make your kitchen and/or bathroom look rich and pleasing. As well as laminate floor products that are designed using new technology to outstand most basic possible damages, and of course the laminate floor will make your house look much more expensive and beautiful. If you were our previous customers you have already experienced and enjoyed our quality products of granite countertops and laminate flooring, now we have recently added something new to our products section, which is cabinets and natural stone fireplaces. Make sure to take a look in those new sections, you will find some beautiful and unique cabinets and fireplaces for your house. We suggest you visit westcoastgraniteinstallations.com - West Coast Granite Installations, Inc. if you need professional installations services for your granite or other products obtained from us. Granite is by far one of the best material choices for your countertop in kitchen and in bathroom. Not only does it provide a natural beauty to your kitchen or bathroom, it is also water and heat resistant, unlike wood and other materials it will last much longer. Granite countertops are becoming more popular and are often placed in rich high class houses. $135 for a piece of 96" x 26"
$169 for a piece of 96" x 26"
$90 for a piece of 96" x 26"
$189 for a piece of 96" x 26"
for all featured and other products.